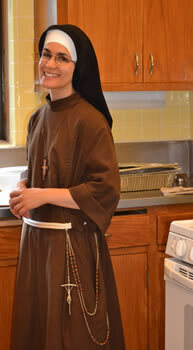 Sr. Alicia from Mission of Our Lady of the Angels in Chicago, IL is competing on Chopped Monday evening. I’m looking forward to watching this episode and how the ingredients (listed in the pithy post) are transformed. I haven’t had the privilege of meeting Sr. Alicia, or any of the other members of this newly formed, emerging community. I do know their founder Fr. Bob having worked with him for years. Sr. Stephanie runs the Chicago Marathon every year, along with a team, raising money for outreach in this neighborhood. There has to be something exciting and nerve wracking about opening a basket and needing to use what’s inside. Contestants may add ingredients from the pantry as they transform the incongruous ingredients into some tasty morsel for the Chef/Judges to taste and make comments on. Chefs learn skills over time from washing dishes and knife cuts to preparing a perfectly cooked steak and sublime desserts. Over time the palate is developed and refined as understanding of flavors, pairing said flavors and cooking technique and skill develops. As the skill and technique develop, an artistry develops. As the palate and skill develop the discernment of and need for good quality ingredients develops. This is all dependent upon drive, ambition, and a willingness to take risks and focus in on the skill set. I noted over time that the judges always focus in on the plate before them, not the person in front of them. That the critique, while somewhat subjective, is fair and kind, offering the Chef/Contestants information and insight. Comments are never mean. I have noticed, too, that the Chefs have lots of the same qualities I see in quilters from raging self doubt, confidence in their skill, to over confidence. The confidence in skill and artistry is evident as it should be. Chefs who become contestants come for a variety of reasons from wanting/needing to prove something to outright fun. Chef’s who become the Head Chef in restaurants have worked incredibly hard to get where they are, developing and honing skill, often mentoring others along the way. What I like about watching Chopped in particular is the process, from seeing the basket ingredients to the finished plates, how each different Chef can take the ingredients and do something completely different from every other Chef. The quilting community is much the same here. It’s so fun to watch. It’s so fun to see new quilters come into the shop, choose fabrics to make their first quilt. It’s fun to see quilters become teachers and competitors. It’s fun to see some quilters just grow in skill, take risks and enjoy the process. It’s fun to see some quilters grow in skill for the sheer love and beauty of making something that wraps people up in love. Quilters make things that may not last. But what does last? The love. Chefs make something fleeting, but it’s the same something filled with love and skill. Cooking. Quilting. Developing Skill. With Passion and Hope in something fleeting. Something about Love. Kindness. And Passion. Previous postInspiring and just a little crazy!! I like Chopped too, I always think of how fun it would be to do a quilty version… open a basket of fabrics… So fun to see everyone’s unique perspective. Speaking of watching people make their first quilt… my daughter just started her first, and it’s been so interesting to see her choices! I love it! Oh that would be so much fun watching your daughter make her choices. I’d love to see pictures at some point. And now the ideas are flowing for how this Chopped bit can happen…thinking!